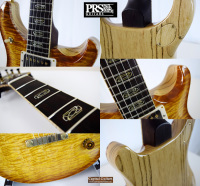 PRS Private Stock guitars are all incredible works of luthier art, but this instrument is in a league all it's own, even for a Private Stock guitar. Offered here is Private Stock #6487 built in 2016, the specs of which are amazing. This guitar has a one-piece Curly Maple top finished in high gloss Honey Gold Smoked Burst nitro lacquer. 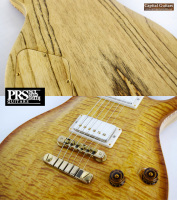 The body is made of a striking slab of Swamp Ash with a clear nitro finish. The neck, fretboard, the headstock overlay and even the tuner buttons are all made of very dark Brazilian Rosewood. The body, neck and headstock are bound in Curly Maple. The fretboard and headstock inlays are made of custom gold MOP "Blade Knots." The neck is PRS' Pattern Vintage shape which is a chunky neck shape that is slightly asymmetrical with a little more mass on the bass side of the neck versus the treble side and measures .89" at the 1st and .99" at the 12th. The electronics include 58/15 LT humbuckers, with two volume, two push-pull tone controls with coil splitting and a three-way toggle. 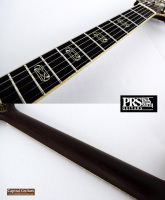 The bridge is an aluminum bronze PRS two piece stoptail and the tuners are gold/nickel Phase III locking models. This guitar has a total weight of just 8.1 pounds! 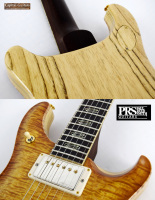 PRS didn't leave anything out with this amazing guitar! The 594 is named for it's unique string scale, 24.594", making the scale length of this model just under a 10th of an inch longer than the McCarty's typical 24.5". It's still a short scale, 22-fret design, but that tiny bit of added scale length generates a bit more clarity and brightness in the guitar's tone and is just one of the many little details that makes this model special. Play this amazing instrument and your Les Paul will soon become a case queen. In fact, this guitar could replace your Gustavsson or Yaron should you be lucky enough to own one. It plays and sounds as good or better than any of the above and none of the aforementioned guitars is as beautifully built as this Private Stock. Please check out the brief sound sample provided to get a small taste of the tone of this fabulous instrument. Built in 2016 this guitar remains in near mint condition with no flaws of any significance to be found. 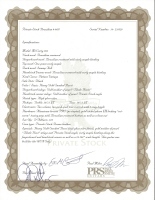 It comes in it's similarly nice Private Stock leather case with all the original paperwork. Replacing this guitar new today would come at a cost of nearly $12K. Get this magnificent guitar in near new condition at a one-third discount. 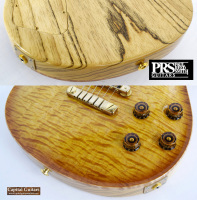 Truly an exceptional, one-of-a-kind, investment-grade electric guitar!